By Ronald J. Allen, S. David Stulberg, M.D., and Victoria Anne Brander, M.D. 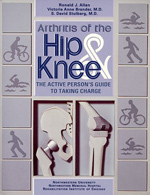 This comprehensive, easy-to-understand book highlights recent substantial advances made in the treatment of osteoarthritis of the hip and knee. It encourages patients to take charge of their situation: to actively participate in the decision-making about their treatment and rehabilitation and to become and stay physically active.